I slipped out of bed and dressed as quietly as I could while my husband snored in the pre-dawn hours when he sleeps best. I invited Dakota, our yellow lab, to ride along with me and we raced the sunrise toward our appointment. 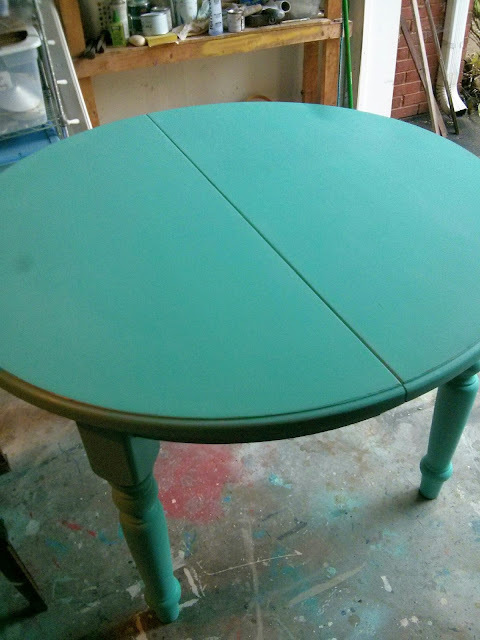 I had told my friend Jill the day before that I could meet her at 7am to see the table she had refinished and posted for sale on Facebook. I’m a morning person, and after seven years of starting my day at 3:30am to work the morning shift at Starbucks, I felt like I had slept in. I wasn’t sure I would buy the table, but I was too intrigued by it to let the opportunity pass. When Jill lifted the garage door and I saw its cheery robin egg blue hue in person, I was smitten. It was solid wood, round with a leaf that would increase the surface space if I needed it, and did I mention I loved the color? It was also just the right price, so I paid my friend and we loaded it into the back of my trusty 13-year-old Suburban. With its legs sticking up in the air like a happy dog asking for a belly rub, I drove my blue table to its new home. My husband Bob was barely awake when I practically bounced into the bedroom and greeted him with the news. In his defense, he isn’t a morning person and normally we consult each other before purchases of this nature. After he was coherent, he pulled on a pair of shorts and traipsed out to the garage to see my new prize. When I lifted the hatch on the Suburban, he was NOT smitten. It’s blue, he said, dismayed. I know, I replied calmly. It’s ugly, he declared, attempting to disparage it. I like it, I countered, unfazed. Why do you need a table anyway, he questioned. I’m a writer. I need a desk, I reasoned. It’s not a desk, it’s a table, he observed. It’s my desk and I need it, I stated. The table now sits in the sunroom facing a large bank of windows. It is already strewn with papers and books, and I sit there daily, writing. I’ve said it out loud. I am a writer. The hard-earned money I spent on a harbinger of hope hasn't made me a writer, but it has given my the dream the gravitas it needs. I’ve always loved words and have a degree that tells the world I know how to put them together to tell stories. Until now, though, I’ve been most comfortable telling other people’s stories. Today, I begin telling you mine. Do you have your own version of my blue table? What does it signify? Tell me about it in the comments. The first step...declaring it out loud. You are a writer, my friend! Wishing you many productive and happy hours at your robin-egg blue desk. It may not be traditional, but it's full of creativity - like you - and a beautiful spring color. Look forward to hearing your story!